U.S. President Donald Trump speaks during a news conference in the East Room of the White House, Jan. 10, 2018, in Washington. U.S. President Donald Trump said Wednesday that it seemed "unlikely" he would need to meet with special counsel Robert Mueller about Mueller's investigation into allegations that Trump's presidential campaign had ties with Russia. Trump made the comment during a news conference after a meeting with Norwegian Prime Minister Erna Solberg. He reiterated his statement that there was "no collusion" with Russia, adding, "It seems unlikely that you'd even have an interview." "There is collusion, but it's really with the Democrats and the Russians," he said, adding, "The witch hunt continues." FILE - Special counsel Robert Mueller (R) departs after briefing members of the U.S. Senate on his investigation into potential collusion between Russia and the Trump campaign on Capitol Hill in Washington, U.S., June 21, 2017. 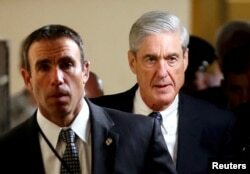 Mueller has reportedly indicated to Trump's attorneys that his team would like to interview the president as part of the investigation. Trump has called the investigation a "Democratic hoax." So far, the investigation has resulted in the indictment of former campaign chairman Paul Manafort and a guilty plea from former national security adviser Mike Flynn. Mueller's team has interviewed a number of Trump aides, including Trump's son-in-law, Jared Kushner, and former chief of staff Reince Priebus. Earlier Wednesday, Trump called the investigation "the single greatest Witch Hunt in American history." Trump also assailed California Democratic Senator Dianne Feinstein, calling her "sneaky" because on Tuesday she released a transcript of an August interview with the head of a firm that produced a dossier containing allegations about Trump's presidential campaign and Russia. Feinstein is a member of the Senate Judiciary Committee, which received the documents from Glenn Simpson, the co-founder of research group Fusion GPS. Simpson said he gave the dossier about Trump to the FBI because he was "very concerned" about a potential national security matter. "The fact that Sneaky Dianne Feinstein, who has on numerous occasions stated that collusion between Trump/Russia has not been found, would release testimony in such an underhanded and possibly illegal way, totally without authorization, is a disgrace," Trump said. He called for a "tough primary" election against her, although she is a Democrat and the Republican Trump holds no sway over Democratic political affairs. Feinstein unilaterally released a lengthy transcript of Simpson's testimony without telling the majority Republican bloc on the Judiciary Committee. Simpson's firm hired Christopher Steele, a former British spy, to produce the dossier, and that research was paid for by Democrats, including the campaign of Trump's election opponent, Democrat Hillary Clinton. A conservative website had earlier sought information about Trump via Fusion GPS but stopped its investigation of the then-Republican candidate once it became apparent that he would be his party's nominee. Later, a lawyer for Clinton's campaign and the Democratic National Committee began paying Fusion GPS to investigate Trump's past. "From my perspective there was a law enforcement issue about whether there was an illegal conspiracy to violate the campaign laws," Simpson said. Trump has dismissed the dossier and repeatedly denied that his campaign colluded with Russia. Trump has contended that the investigations are an excuse by Democrats to explain his upset win over Clinton, a former secretary of state. Simpson said Steele also told him the FBI believed information in the dossier "might be credible" because they had a source inside the Trump organization who "indicated the same thing." "It was someone like us who decided to pick up the phone and report something," Simpson said. FILE - Glenn Simpson, co-founder of the research firm Fusion GPS, arrives for a scheduled appearance before a closed House Intelligence Committee hearing on Capitol Hill in Washington, Nov. 14, 2017. Feinstein, the top Democrat on the Judiciary Committee, said Simpson requested that the transcript of his testimony be released to the public and said that the American people deserved the chance to see his words and judge for themselves. "The innuendo and misinformation circulating about the transcript are part of a deeply troubling effort to undermine the investigation into potential collusion and obstruction of justice. 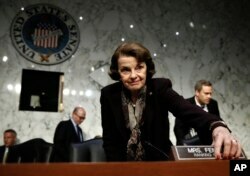 The only way to set the record straight is to make the transcript public," Feinstein said in a statement. Judiciary Committee Chairman Charles Grassley, an Iowa Republican, objected to Feinstein's release of the testimony. A Grassley spokesman, Taylor Foy, called Feinstein's actions "confounding" and said she had undermined the committee's "ability to secure candid voluntary testimony relating to the independent recollections of future witnesses." The committee is conducting one of several investigations into Russian influence on the 2016 presidential election and possible connections with the Trump campaign. U.S. intelligence agencies concluded last year that Russia had conducted a campaign targeting the election with the goal of hurting Clinton's chances of winning while boosting Trump's chances. In addition, Mueller is investigating whether Trump obstructed justice by firing former FBI chief James Comey when Comey was heading the agency's Russia probe before Mueller was appointed to take over the investigation.